Henry II (6 May 973 – 13 July 1024), also known as Saint Henry, Obl. S. B.,[a] was Holy Roman Emperor ("Romanorum Imperator") from 1014 until his death in 1024 and the last member of the Ottonian dynasty of Emperors as he had no children. The Duke of Bavaria from 995, Henry became King of Germany ("Rex Romanorum") following the sudden death of his second cousin, Emperor Otto III in 1002, was crowned King of Italy ("Rex Italiae") in 1004, and was crowned by the Pope as Emperor in 1014. Henry was born in May 973, the son of Duke Henry II, Duke of Bavaria, and Gisela of Burgundy. Through his father, he was the grandson of Henry I, Duke of Bavaria, and the great-grandson of King Henry I of Germany. By his mother, he was the grandson of King Conrad I of Burgundy, and the great-grandson of King Rudolf II of Burgundy. The elder Henry came into conflict with his cousin Holy Roman Emperor Otto II, in 974. The elder Henry and Otto II disputed each other's claims to authority over the Duchy of Swabia: Henry claimed the duchy as his birthright while Otto II maintained his right to name a duke of his choosing. After an initial failed revolt, Otto II imprisoned the elder Henry in Ingelheim. After escaping, Henry again revolted against Otto II. When this second revolt failed, Otto II deposed Henry as Duke of Bavaria and sent him into exile under the custody of the Bishop of Utrecht in April 978. As a consequence of his revolt, the Emperor stripped the Duchy of Bavaria of its southeastern territories bordering Italy and formed the Duchy of Carinthia. During his father's exile, the younger Henry lived in Hildesheim. As a child he was educated in the Christian faith by Saint Wolfgang, bishop of Regensburg, and then studied at the Hildesheim Cathedral. The Emperor himself ensured the younger Henry received an ecclesiastical education in order that by becoming a religious official he would be prevented from participating in the Imperial government. The death of Otto II in 983 allowed the elder Henry to be released from custody and to return from exile. The elder Henry claimed regency over Otto III, the three-year-old child of Otto II. After a failed attempt to claim the German throne for himself in 985, the elder Henry relinquished the regency to the child's mother Theophanu. In return for his submission to the child king, Henry was restored as Duke of Bavaria. The younger Henry, now thirteen years old, was named his regent over Bavaria. When the elder Henry died in 995, the younger Henry was elected by the Bavarian nobles as the new Duke to succeed his father as "Henry IV." In 999 Henry married Cunigunde of Luxembourg, a daughter of Siegfried, Count of Luxembourg. This marriage granted him an extensive network of contacts in Germany's western territories. In 1001, Emperor Otto III experienced a revolt against his reign in Italy. The Emperor sent word for Henry II to join him with reinforcements from Germany, but then died unexpectedly in January 1002. Otto was only 21 at the time of death and had left no children and no instructions for the Imperial succession. In the Ottonian dynasty, succession to the throne had belonged to the Saxon branch, not the Bavarian line of which Henry was a member. Rival candidates for the throne, including Ezzo of Lotharingia, Margrave Eckard I of Meissen, and Duke Herman II of Swabia, strongly contested Henry's right to succeed Otto III. As the funeral procession moved through the Duchy of Bavaria in February 1002, Henry met the procession in Polling, just north of the Alps. To legitimize his claims, Henry demanded Archbishop Heribert of Cologne give him the Imperial Regalia, chief among them being the Holy Lance. Heribert, however, had sent these ahead of the procession, possibility out of distrust of Henry and possibly because he favored the succession of his relative Duke Herman II of Swabia as the next king. In order to force Herman II to relinquish the Holy Lance to him, Henry imprisoned the Archbishop and his brother the Bishop of Würzburg. With neither the symbols of imperial authority, the crown jewels, nor the cooperation of Heriberto, Henry was unable to convince the nobles attending Otto III's funeral procession to elect him as king. A few weeks later, at Otto III's funeral in Aachen Cathedral, Henry again attempted to gain the support of the Kingdom's nobles and was again rejected. So it was without the support of the Kingdom's nobility that Henry took the radical action of having himself anointed and crowned King of Germany ("Rex Romanorum") by Willigis, Archbishop of Mainz on 9 July 1002 at Mainz, in present-day Germany. Henry's action marked the first time a German king was not crowned in Aachen Cathedral since Emperor Otto I began the tradition in 936 and the first time a German king assumed the throne without election by the German nobility. Under the regal name of "King Henry II", he appeared before the Saxons in mid-July in full regal apparel. There, Henry convinced Bernard I, Duke of Saxony to support his claims to the throne. In return for his support, Henry guaranteed Bernard's right to rule the Saxons and to represent their interests before him. Shortly after gaining the support of the Saxons, Henry arranged for Archbishop Willigis to crown his wife, Cunigunde of Luxembourg as Queen of Germany on 10 August 1002 in Paderborn, in present-day Germany. Henry II spent the next several years consolidating his political power within his borders. Herman II, Duke of Swabia, in particular fiercely contested Henry II's right to the throne. The Swabian Duke believed he was Otto III's true successor, as he had married a daughter of Liudof, eldest son of Emperor Otto I. Armed conflicts between Henry II and Herman II broke out but proved to be inconclusive. This forced the two men to fight each other politically for the support of the Swabian nobles. Unable to decisively defeat Herman in Swabia, Henry II attempted to legitimize his seizing the throne by traveling throughout the various duchies of his kingdom – Saxony, Bavaria, Swabia, Upper Lorraine, Lower Lorraine, Franconia. This was done in order to obtain the general consent of his subjects as opposed to traditional election. Henry II's familial ties to the Ottonian dynasty eventually caused the kingdom's nobles to accept him as king. After being defeated at a battle near Strasburg, Herman II submitted to Henry II's authority on October 1, 1002. In exchange for this surrender, Henry II allowed Herman II to remain Duke of Swabia until his death the following year, after which, although recognizing the minor Hermann III as his father's titular successor, Henry II effectively assumed all power over the Duchy himself. In 1003, Margrave of Nordgau Henry of Schweinfurt in Bavaria revolted against Henry II's rule. Henry II had promised to install the Margrave as his successor to the Duchy of Bavaria in exchange for supporting his claim to the German crown. Upon assuming the throne, however, Henry II refused to honour his promise and instead supported the rights of the Bavarians to elect their own duke. With Henry II's support, Count Henry I of Luxembourg became the Duke of Bavaria as Henry V. Betrayed by the King, Margrave Henry allied with Duke Boles?aw I of Poland against him. However, his rebellion was soon quashed and the Nordgauian Margrave was deposed in 1004. Henry II then abolished the March of Nordgau, established the Diocese of Bamberg in 1007, and transferred secular authority over the March's former territory to the Diocese in order to prevent further uprisings. The death of Otto III in 1002 and the resulting political turmoil over his successor allowed Italy to fall from German control. Margrave Arduin of Ivrea proclaimed himself King of Italy at Pavia soon after the Emperor's death. Accompanied by Archbishop Arnulf II of Milan, Arduin won the support of the Italian territorial magnates. Arduin, however, had been excommunicated in 997 for the murder of the Bishop of Vercelli. This allowed Arduin's enemies in the Church, led by Archbishop Frederick of Ravenna, to side with the German King Henry II as the rightful ruler of Italy. Henry II sent Duke Otto I of Carinthia, over the March of Verona to face Arduin, successfully defeating him at the Battle of Fabrica in 1003. In 1004 Henry II responded to calls for aid from Italian bishops and led an invasion into Italy against Arduin. Henry II gathered his troops at Augsburg and marched through the Brenner Pass to Trento, Italy. After initial military successes, much of the Italian clergy and some noble families swore allegiance to Henry II, including Archbishop Arnulf II. Joining Henry II in Bergamo, Arnulf II crowned him as King of Italy ("Rex Italiae") on May 14, 1004 in Pavia. Unlike his predecessors, after gaining the Kingdom of Italy Henry II wore two crowns, one for Germany and one for Italy, instead of a common crown representing both realms. The following night, the inhabitants of Pavia revolted against Henry's rule. Henry ordered his troops to massacre the population in response. After receiving the homage of the remaining Italian nobles, Henry returned to Germany in the early summer of 1004 without first traveling to Rome to claim the Imperial crown. This is most likely due to opposition from Pope John XVIII. Henry would not return to Italy for a decade, leaving the Kingdom to govern itself. Henry returned to Germany to take military action against the rebellious Duke Boleslaw I of Poland. The untimely death of Emperor Otto III at age 21 in 1002 upset the young Emperor's ambitious renovatio plans, which were never fully implemented. Henry II, opposed to Otto III's eastern policies, reversed Imperial policy towards the east, resulting in the deterioration of the excellent relations Germany and Poland had enjoyed during Otto III's reign, particularly its relationship with Duke Boleslaw I of Poland. Boleslaw I had been a loyal supporter of Otto III, but Henry II's actions caused Boles?aw I to seek new German allies. Of the major candidates seeking to succeed to the German throne, Boles?aw I supported Margrave Eckard I of Meissen over Henry. Only after Eckard was assassinated by Saxon nobles in April 1002 did Boles?aw I lend his support to Henry II. Boles?aw I traveled to Merseburg on July 25, 1002 and paid homage to the new German king. Boleslaw I had taken advantage of Germany's internal strife following Otto III's death, occupying important German territories west of the Oder River: the March of Meissen and the March of Lusatia. Boles?aw I took control of these territories following the assassination of Margrave Eckard I. Henry II accepted Boles?aw I's gains, allowing the Polish Duke to keep Lusatia as a fief, with Boleslaw I recognizing Henry II as his overlord. Henry II refused to allow Boles?aw I to keep possession of Meissen, however. Shortly after Boleslaw I's departure from Merseburg, an assassination attempt was made against him. Though the attempt failed, Boleslaw I was seriously injured. The Polish Duke accused Henry II of instituting the attack, and relations between the two countries were severed. Boleslaw I also refused to pay tribute to Germany. Prior to open rebellion in 1004, Boleslaus III, Duke of Bohemia, was ousted in a revolt in 1002. Boleslaw I intervened in the Bohemian affair and reinstalled Boleslaus III upon the Bohemian throne in 1003. Boleslaus III soon undermined his own position, however, by ordering a massacre of his leading nobles. Bohemian nobles secretly sent a messenger to Boleslaw I, requesting his direct intervention in the crisis. The Polish duke willingly agreed and invited the Bohemian duke to Poland. There, Boleslaus III was captured, blinded, and imprisoned, where he would remain until his death some thirty years later. Claiming dominion over Bohemia for himself, Boleslaw I invaded Bohemia in 1003 and conquered the duchy without any serious opposition. Bohemia had previously been under the influence and protection of Germany, with the Polish invasion further increasing tension between Germany and Poland. Boles?aw I openly rebelled against Henry II's rule in 1004, burning down the castle in Meissen in an act of war. Returning from Italy after reclaiming the Italian throne, Henry II launch a military campaign against Poland in 1004 that would last until 1018, spanning three wars and several smaller campaigns. Returning from his first expedition to Italy, Henry II gathered an army to march against Poland. The previous year in 1003, Henry II had formed an alliance with the pagan Slavic Lutici tribe. As a consequence of their military alliance, Henry II halted Christianization efforts among the Slavic peoples. The new alliance with the Western Slavs against Poland was controversial, however. Many German nobles had hoped for continued missionary work and the direct submission of the Elbe Slavs. In addition, many German nobles opposed the war because they had developed family ties with Poland during Otto III's reign. Similarly, members of the clergy, including Bishop Bruno of Querfurt, saw future tithe payments and Polish support for missionary work in Prussia evaporating due to the war. In preparation for Henry II's coming military invasion, Boles?aw I developed a similar alliance with other Slavic peoples. With his conquest west of the Oder River in 1002, his domain stretched from the Baltic Sea to the Carpathian Mountains. Furthermore, the Polish Duke was connected by kinship to numerous princes of Scandinavia. Henry II answered Boles?aw I's rebellion with a military invasion in the summer of 1004, reaching the Ore Mountains in northern Bohemia. He then conquered the castle at ?atec and killed the Polish army left there. Simultaneous to Henry II's invasion, Jaromir (the younger brother of the deposed Bohemian Duke Boleslaus III) invaded Bohemia with German military support. At Merseburg, Jaromír promised to hold Bohemia as a vassal under Henry II, definitively incorporating Bohemia into the Holy Roman Empire. Forcing Boles?aw I to flee, Jaromír occupied Prague with a German army and proclaimed himself Duke. The state he regained was a small one, however, as Polish forces would hold Moravia, Silesia, and Lusatia until 1018. During the next part of the offensive, Henry II retook Meissen and, in summer 1005, his army advanced deep into Poland, suffering significant losses along the way. At the Polish city of Pozna?, the German forces were ambushed by the Polish army and suffered significant losses. Meeting in Pozna?, Henry II and Boleslaw I signed a peace treaty. According to its terms, Boleslaw I lost Lusatia and Meissen and was forced to give up his claim to the Bohemian throne. The peace lasted only two years as neither party recognized the claims of the other. In 1007, Henry II denounced the Peace of Pozna?, resulting in Boleslaw I's attack on the Archbishopric of Magdeburg as well as his re-occupation of marches of Lusatia and Meissen including the city of Bautzen. The German counter-offensive began three years later in 1010. It was of no significant consequence, beyond some pillaging in Silesia. In 1012, a second peace treaty between Germany and Poland was signed. Boleslaw I quickly broke the peace, however, and once again invaded Lusatia. Boleslaw I's forces pillaged and burned the city of Lubusz. In 1013, a third peace treaty was signed at Merseburg, requiring in part that Boleslaw I recognize Henry II as his overlord in exchange for receiving the March of Lusatia and the March of Meissen as fiefs. To seal their peace, Boleslaw I's son Mieszko II married Richeza of Lotharingia, daughter of the Count Palatine Ezzo of Lotharingia, granddaughter of Emperor Otto II. John XVIII reigned as Pope from 1003 until 1009. He was succeeded by Pope Sergius IV from 1009 to 1012. Both John XVIII and Sergius IV, though the nominal Pope, were subservient to the power John Crescentius. As leader of the Crescentii clan and Patrician of Rome, John Crescentius was the effective ruler of the city. John Crescentius' influence prevented Henry II from meeting the Pope on numerous occasions, preventing him from claiming the imperial title. Following Sergius IV's death in 1012, Benedict VIII was elected to succeed him. Upon assuming the chair of St. Peter, however, Benedict VIII was forced to flee Rome by Gregory VI, an antipope, whom John Crescentius installed as the new head of the Catholic Church. Fleeing across the Alps to Germany, Benedict VIII appealed to Henry II for protection. Henry II agreed to restore Benedict VIII to his papal throne in return for his coronation as Emperor. Near the end of 1013, Henry II gathered his army at Augsburg to march into Italy. Earlier in 1013, Henry signed a peace treaty with Duke Boles?aw I of Poland at Merseburg. The peace with Poland gave Henry opportunity to address affairs in Italy. On the march across the Alps, Henry was accompanied by his wife, Queen Cunigunde and a number of clerics. Upon reaching Pavia other bishops and abbots joined him. Margrave Arduin of Ivrea, who still ruled important parts of northern Italy, offered to submit to Henry as his overlord and offered his sons as hostages if Henry would recognize Arduin as King of Italy. Henry refused. Henry's forces trapped Arduin in his capital of Ivrea, where he remained until 1015. Henry II arrived in Rome in early 1014, restoring Benedict VIII as Pope. On February 14, 1014, the Pope crowned Henry II as Holy Roman Emperor ("Romanorum Imperator") in St. Peter's Basilica. Then, under the presidency of the Emperor and Pope, the two held a synod in Rome, appointed five bishops, issued decrees against simony and promoting chastity within the clergy, and ordered the restitution of Church property. Shortly afterwards, the Emperor moved north again where he established the Diocese of Bobbio. Celebrating Easter in Pavia, Italy, Henry then returned to Germany in mid-May 1014. He left the rule of Rome to the Pope and thereafter rarely intervened in the politics of Italy or the Papal States. In 1015 the conflict with Arduin came to a close when Arduin became ill and sought peace with Henry II. He resigned the office of Margrave of Ivrea to become a monk in a monastery at Fruttuaria. He died on December 14, 1015. His brief "reign" as King of Italy would be the last time a native Italian would reign over Italy until its unification under Victor Emmanuel II in 1861. After Arduin's death Henry ordered the Margraviate of Ivrea, which had given the Ottonian Emperors so much trouble, dissolved. The peace agreement of 1013 between Henry II and Duke Boleslaw I of Poland quickly deteriorated. In 1014, with Henry II absent from Germany, Boleslaw I sent his son Mieszko II Lambert to the Duchy of Bohemia in order to persuade the new Bohemian Duke Oldrich into an alliance against Henry II. The mission failed and Oldrich imprisoned Mieszko II. He was released only after the intervention of the Emperor, who, despite the planned invasion of Poland, loyally acted on behalf of his nominal vassal Boleslaw I. As a result, Mieszko II was sent to Henry II's imperial court in Merseburg as a hostage. Henry II probably wanted to force the presence of Boles?aw I in Merseburg and make him explain his actions. The plan failed, however, because, under pressure from his relatives, the Emperor soon agreed to release Mieszko II. At the same time, Henry II entertained Yaroslav, the pretender to the throne of the Kievan Rus'. A son of Kievan Grand Duke Vladimir the Great, he was vice-regent of the Principality of Novgorod at the time of his father's death in 1015. Yaroslav's eldest surviving brother, Sviatopolk I of Kiev, killed three of his other brothers and seized power in Kiev. Henry II's support of Yaroslav was in direct opposition to not only Sviatopolk but to Boleslaw I as well. Years before, Boleslaw I had married one of his daughters to Sviatopolk, making the new Kievan Grand Duke a son-in-law to the Polish Duke. Henry II returned to Germany in 1015 after being crowned Emperor by Pope Benedict VIII and prepared for a third invasion of Poland. With three armies at his command, the largest contingent since the beginning of the conflict in 1004, the Imperial army simultaneously marched in a pincer movement from the German north, south, and center. Henry II himself commanded the center army, supported by allied Slavic tribes, and moved from Magdeburg to cross the Oder river into Poland. Henry II was soon joined from the south by Bohemian Duke Oldrich and from the north by Duke Bernard II of Saxony. As the Imperial army crossed the Oder river and marched across Poland, Henry II's forces killed or captured several thousand Poles, including women and children. But the Imperial army suffered heavy losses throughout the campaign. Boleslaw I sent a detachment of Moravian knights under the command of Mieszko II in a diversionary attack against the Empire's Eastern March. The Imperial army retreated from Poland to Merseburg in order to address the assault without making any permanent territorial gains east of the Oder River. During the retreat to Germany, Gero II, margrave of the Eastern March, was ambushed by Polish forces and killed late in 1015. Following the attack on the Eastern March, Boleslaw I's forces took the offensive. Boleslaw I sent Mieszko II to besiege Meissen in 1017, then under the command of Mieszko II's brother-in-law Margrave Herman I. His attempt at conquering the city failed, however, and he was forced to retreat back to Poland. Henry II and Boleslaw I then opened peace negotiations and a ceasefire was declared in summer 1017. As negotiations failed by autumn 1017, Henry II again marched his army into Poland. His army reached G?ogów, where Boleslaw I was entrenched, but it was unable to take the city. Henry II then besieged Niemcza, but was likewise unable to capture the city. As his army besieged Niemcza, disease brought about from the winter cold devastated the Imperial forces. His attacks unsuccessful, Henry II was forced to retreat back to Merseburg in Germany. With this defeat, Henry II was ready to end the war and begin serious peace negotiations with Boleslaw I. On January 30, 1018, Henry II and Boleslaw I signed a fourth peace treaty, known as the Peace of Bautzen. The Polish duke was able to keep the contested marches of Lusatia and Meissen on purely nominal terms of vassalage, with Boleslaw I recognizing Henry II as his feudal lord. Henry II also promised to support Boleslaw I in the Polish ruler's expedition to Kiev to ensure his son-in-law, Sviatopolk, claimed the Kievan throne. To seal the peace, Boles?aw I, then a widower, reinforced his dynastic bonds with the German nobility by marrying Oda of Meissen, daughter of the Saxon Margrave Eckard I of Meissen. Henry II's involvement in Italian politics and his coronation as Emperor inevitably brought him into conflict with the Byzantine Empire. In 969, Emperor Otto I entered into an alliance with Byzantine Emperor John I Tzimiskes in which both Eastern and Western Empires would jointly-govern southern Italy. Otto I's death in 973 and John I's death in 976 caused this alliance to deteriorate. Otto I's successor in the West, his son Emperor Otto II, and John I's successor in the East, his nephew Emperor Basil II, brought the two Empires once again into conflict over control of southern Italy. Under Otto I and Otto II, the Lombard leader Pandulf Ironhead expanded Western imperial control over central and souther Italy. Originally appointed by Otto I as Prince of Benevento and Capua in 961, Pandulf waged war against the Byzantines as a loyal lieutenant of Otto II. By 978, Pandulf had incorporated all three of the southern Lombard principalities – Benevento, Capua, and Salerno – into the Holy Roman Empire. Pandulf's death in 981, however, weakened Western dominance over the Byzantine Empire in southern Italy. By 982, the entire area once ruled by Pandulf had collapsed. The Byzantines still claimed sovereignty over the Lombard principalities, and the lack of single leader to prevent their advances into Lombard territory allowed the Byzantines to make inroads further north. Facing a joint Byzantine-Muslim force, Otto II was soundly defeated at the battle of Stilo on July 14, 982. The defeat shifted the balance of power in southern Italy into Byzantine favor. While preparing to counterattack the Byzantine advance, Otto II suddenly died while in Rome, with his infant son Otto III succeeding him. With an infant as ruler and a political crisis to address, the Western Empire was unable to challenge Byzantine dominance. This allowed Basil II to build of his defense forces in preparation for a future Western counterattack. In 1017, aided by Norman mercenaries, the Lombard noble Melus of Bari led a successful rebellion against Byzantine control of Apulia. The Byzantine Empire struck back in 1018 under Catepan of Italy Basil Boioannes, delivering a devastating defeat to the joint Lombard-Norman force at the Battle of Cannae. Melus fled to the Papal States following the defeat. With the Byzantine successes in southern Italy, Pope Benedict VIII took an unusual step in 1020, traveling north across the Alps into Germany to discusses the state of affairs in southern Italy with the Emperor. Meeting Henry II in Bamberg, the Pope was accompanied by a large number of Italian secular and ecclesiastical leaders, including Melus. Henry II granted Melus the empty title Duke of Apulia for his actions against the Byzantines. But Melus died just a few days later, on April 23, 1020. After settling some controversies with the bishops of Mainz and Würzburg, the Pope convinced Henry II to return to Italy for a third campaign to counter the growing power of the Byzantine Empire. In 1022, Henry II set out down the Adriatic coast for southern Italy commanding a large force. He sent Archbishop Pilgrim of Cologne ahead with a slightly smaller army along the Tyrrhenian littoral with the objective of subjugating the Principality of Capua. A third army, smaller still, under the command of Patriarch Poppo of Aquileia went through the Apennines to join Henry II in besieging the Byzantine fortress of Troia. Though Patriarch Pilgrim captured Pandulf IV of Capua and extracted oaths of allegiance from both Capua and the Principality of Salerno, all three of Henry II's armies failed to take Troia. The Byzantine troops could not be forced into a pitched battle, and Henry II was forced to turn back, his army weakened by diseases and suffering heavy losses. Henry II almost executed the treacherous prince of Capua, but he relented at the last moment at Pilgrim's pleading. Instead, Henry II sent him off to Germany in chains and appointed Pandulf V to replace him as prince of Capua. Though he failed to achieve his main objective, Henry II left southern Italy in the knowledge that Western Imperial authority still extended deep into that territory. Upon assuming the German throne, Henry II revised many policies of his predecessor, Emperor Otto III. Whereas Otto III had promoted a policy of "Restoration of the Roman Empire" (Renovatio imperii Romanorum), Henry II sought a policy of "Restoration of the Frankish Kingdom" (Renovatio regni Francorum). Compared to the other members of the Ottonian dynasty, Henry II spent relatively little time in Italy, only traveling south of the Alps three times during his twenty-two year reign. He was absent from the Italian peninsula for over a decade between his expulsion of Margrave Arduin of Ivrea in 1004 and his return in 1014 to claim the imperial title, allowing the kingdom to mostly govern itself. Henry II's absence from Italy was primarily due to his continued conflict with Duke Boleslaw I of Poland. During the reign of Otto III, Boleslaw I had been a loyal ally of the Empire. However, the protracted German-Polish wars brought the two nations into open warfare for over sixteen years. Henry II inherited from Otto III several unresolved disputes within the Catholic Church. At particular issue were the resettlement of the Diocese of Merseburg and the Gandersheim Conflict. The Diocese of Merseburg, which had been established by Emperor Otto I in 968 to commemorate his victory against the pagan Hungarians at the Battle of Lechfeld in 955. Established to conduct missionary work among the pagan Slavs, the Diocese was all but abandoned in 983 following a major Slavic revolt against Imperial rule. In 1004, Henry II ordered the reestablishment of the Diocese to resume missionary work among the Slavs and appointed the German chronicler Thietmar of Merseburg to serve as its bishop. In 989, when Otto III was still a child and under the regency of his mother Theophanu, the Gandersheim Conflict broke out. The conflict centered over control of Gandersheim Abbey and its estates. Both the Archbishop of Mainz and the Bishop of Hildesheim claimed authority over the Abbey, including the authority to anoint the Abbey's nuns. Otto III and Theophanu's intervention eased the tensions between the parties, but did not permanently settle the issue. Henry II resolved conflict in 1006, ruling that the Bishop of Hildensheim held authority over the Abbey and its nuns. In May 1017, the Empress Cunigunde of Luxembourg, while staying at the imperial estates in Kaufungen, became seriously ill. Henry II vowed to found a monastery on the site if she recovered. Following her recovery in 1018, Henry ordered construction of the Kaufungen Abbey. Following Henry II's death in 1024, Cunigunde retired to the Abbey, where she remained until her own death in 1040. Sincerely religious, Henry II supported service to the Church (he was celibate) and promoted various monastic reforms. He also strongly enforced clerical celibacy, perhaps partly in order that the public land and offices he granted to clerics would not be devised to heirs. He encouraged the reform of the Church, fostered missionary activity, and made several charitable foundations for the poor. Henry II wished to become a monk, and in virtue of his imperial power he ordered the Abbot of Verdun to accept him in his monastery. Whereupon, the Abbot ordered him, in virtue of the vows he had professed, to continue the administration of the empire. Henry II fulfilled his duties in the spirit of humility and service, being convinced that temporal power was given by God for the good of the people. Henry II succeeded in persuading Pope Benedict VIII to include the word "Filioque" in the Nicene Creed. This word provided that the Holy Spirit emanated from both God the Father and God the Son. Together with Papal primacy, differences over this doctrine were among the primary causes of the Great Schism of the Church in 1054. The Ottonian dynasty had long used the Church as an integral part of the secular government of the Empire. This "Imperial–Church System" reached its climax under Henry II. Beginning with Emperor Otto I, the Ottonians used the Church as a major counter-force to the powerful German Stem duchies. The dukes had long been strong and powerful figures, looking to the interests of their respective duchies above the interests of the Empire as a whole. In an effort to unify the Empire under their leadership, the Ottonians increasingly associated themselves with the Church, claiming "divine right" to rule the Empire and presenting themselves as the protector of Christendom. As a key element of this policy, the Ottonians sought to strengthen ecclesiastical authorities, chiefly bishops and abbots, at the expense of the secular nobility. Unlike the dukes, such ecclesiastical figures could not pass their title and lands to any descendants. Instead, the Emperors reserved the appointment and investiture of bishops of the Empire's proprietary churches for themselves. This ensured the bishops remained loyal to the reigning Emperor, despite the fact that canon law demanded such officials remain loyal to the transnational Church. Under Henry II, an increased number of counties were assigned to the secular rulership of bishops. He made large donations from imperial land to the monasteries and dioceses of the Empire. With these extensive donations and the expanded powers of the Emperor, the Church gradually lost its autonomy. The imperial monasteries and other Church institutions were so numerous, donations and the secular privileges granted them so broad, that they essentially developed into an imperial bureaucracy. The German chronicler Thietmar of Merseburg describes the special relationship between Henry II and the bishops of the Empire as more intense than any other ruler in the early Middle Ages. Under Henry II, the division between secular and ecclesiastical affairs was blurred beyond distinction. This caused the clergy to look to the Henry II as their feudal lord, especially in the area of military service. The ecclesiastical rulers came to make up a large part of Henry II's imperial army. For most of Henry II's campaigns against Poland and the Byzantine Empire, the spiritual princes constituted the largest contingent. Henry II thus strengthened his control over the Empire through the clergy, while gaining a greater control over the Church's spiritual policy. In 1003, Henry of Schweinfurt, Margrave of the Nordgau in Bavaria, revolted against Henry II's rule. Henry II had promised to install the margrave as his successor to the Duchy of Bavaria in exchange for supporting his claim to the German crown. Upon assuming the throne, however, Henry II refused to honour his promise. Instead, Henry II deposed the Margrave Henry in 1004 and abolished the March outright. To assume secular authority over the March's former territory, in 1007, Henry II announced his desire to establish a new diocese in Germany: the Diocese of Bamberg. Growing up in the Duchy of Bavaria, Henry II was fond of Bamberg, even giving his estates there to his wife Cunigunde of Luxembourg as her dower upon their marriage. Mission work among the Slavs of the region had previously been conducted by the Imperial Abbey at Fulda as part of the Diocese of Würzburg. To establish his diocese, Henry II needed to overcome the consideration resistance of the Bishop of Würzburg, as the new diocese would comprise about one-fourth of the former's territory. Henry II desired the new Diocese to aid in the final conquest of the pagan Slavs in the area around Bamberg. Henry II held a synod in Frankfurt on November 1, 1007, to build consensus among the bishops of the Empire on the establishment of the Diocese of Bamberg. The Bishop of Würzburg, who hoped that the loss of territory from the formation of the new Diocese would result in his elevation to the rank of Archbishop, was not in attendance. Henry II also assigned a portion of the territory from the Diocese of Eichstätt to his planned Diocese. At the synod, Henry II obtained permission for the foundation of the Diocese. It was also decided that Eberhard, Henry II's Imperial Chancellor, would be ordained by Willigis, the Archbishop of Mainz and Primate of Germany, to head the new Diocese. Henry II made many wide-ranging gifts to the new Diocese to ensure its solid foundation. Henry II assigned many counties in the Duchy of Franconia, the Duchy of Saxony, the Duchy of Carinthia, and the Duchy of Swabia. As under his predecessors Emperor Otto II and Emperor Otto III, the various German dukes of the Empire grew increasingly independent from the Emperor. A "German" identity had begun to develop. South of the Alps in Italy also saw the various regional lords grow in independent power. 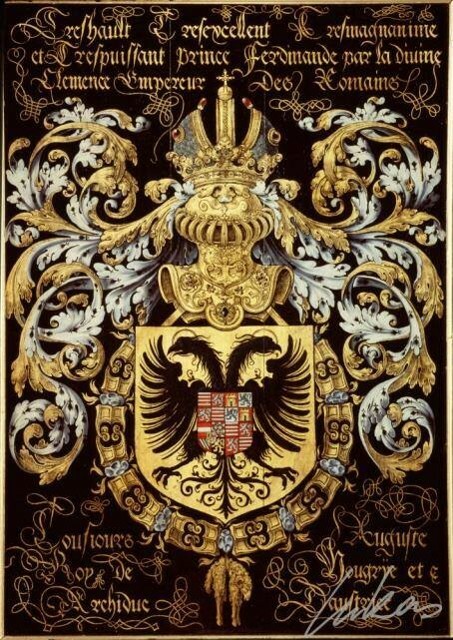 Increasingly, the Empire's duchies were becoming personal possessions of their respective ducal family as opposed to component parts of the Empire. Henry II's policy towards the nobles was focused on overcoming these family structures within the duchies in order to restore imperial dominance and control. Henry II, as well as the other Ottonians, relied upon his connection with the Church to justify his power and higher status over the dukes. However, unlike under Emperor Otto I and Otto II, the various German dukes were no longer bound to the Emperor by close family ties. While the Duchy of Franconia and the Duchy of Saxony formed the core imperial support, the Duchy of Swabia and the Duchy of Bavaria had grown increasingly rebellious. Unlike his predecessors, Henry II was unwilling to show clemency to those dukes who had rebelled against his authority. This caused a sharp raise in conflict with the secular nobility, which forced Henry II to reinforce the position the clergy enjoyed in the governance of the Empire. It was only through the support of the clergy that Henry II survived the numerous noble revolts against his rule during the first decade of his reign. Even his relatives, such as his brothers-in-law Duke Henry V of Bavaria, and Count Frederick of Moselle, revolted against his reign. As a result, Henry II systematically reduced the internal power structures of the Bavarian and Swabia dukes. Henry II's lack of sensitivity to the secular nobility also resulted in the series of wars against Poland. Under Otto III, Polish Duke Boles?aw I Chrobry was viewed a valued ally. Henry II, however, only saw him as a subject. In 1019, the once loyal Duke Bernard II of Saxony, grandson of Emperor Otto I's trust lieutenant Hermann Billung, rebelled against Henry II's reign. Though an early supporter of Henry II, Bernard II grew frustrated at Henry II's lack of respect for the secular nobility. Returning to Magdeburg, Germany from southern Italy to celebrate Easter, Henry II fell ill in Bamberg, Bavaria. After celebrating Easter, Henry retired to his imperial palace in Göttingen. He died there on 13 July 1024 at the age of 51, after suffering from a chronic, painful urinary infection. Henry had been working with the Pope to convene a Church council to confirm his new system of imperial-ecclesiastical relations before he died, leaving this effort unfinished. Empress Cunigunde arranged for Henry to be interred at Bamberg Cathedral. Though he left the Empire without significant problems, Henry II also left the Empire without an heir. Some speculate that both he and Cunigunde had taken mutual vows of chastity, because of their piety and the fact that they had no royal issue, but this is disputed. Their marriage being childless, the Saxon dynasty of the Ottonians died with Henry. In early September 1024 the German nobles gathered in Kamba and began negotiations for selecting a new king. The nobles elected the Franconian noble Conrad II as Henry II's successor, who became the first member of the Salian dynasty. 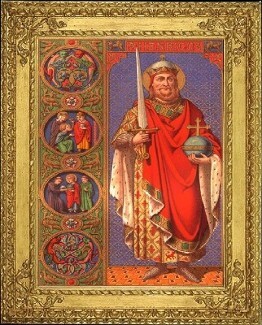 St. Henry II was canonized in July 1147 by Pope Bl. Eugenius III; his spouse, Cunigunde was canonized on 29 March 1200 by Pope Innocent III. His relics were carried on campaigns against heretics in the 1160s. He is the patron saint of the city of Basel, Switzerland, and of St Henry's Marist Brothers' College in Durban, South Africa. St. Henry's name, which does not appear in the Tridentine Calendar, was inserted in 1631 in the Roman Calendar as a commemoration within the celebration of Saint Anacletus on 13 July, the day of his death and the traditional day for his celebration on a local level. In 1668, it was moved to 15 July for celebration as a Semidouble. This rank was changed by Pope Pius XII in 1955 to that of Simple, and by Pope John XXIII in 1960 to that of Third-Class Feast. In 1969, it was returned to its original date of 13 July as an optional Memorial. During his lifetime, Henry II became an oblate of the Benedictine Order, and today is venerated within the Order as the patron saint of all oblates, along with St. Frances of Rome. Henry II was a member of the Ottonian dynasty of kings and emperors who ruled the Holy Roman Empire (previously Germany) from 919 to 1024. In relation to the other members of his dynasty, Henry II was the great-grandson of Henry I, great-nephew of Otto I, first-cousin once removed of Otto II, and a second-cousin to Otto III.